In going through my papers, none of which I ever seem to be able to discard, I came across Endless Knots, which you had sent me in 2004 --- I loved rereading it -- still cannot throw it away -- and found your blog on Google... in the morass of boring stuff, it brightened my snow-dimmed day.. Thanks again -- will follow your blog (I am not a blog reader -- too many out there) with enthusiasm..may I put you on the email list? It's brief, but as entertaining as I can make it -- Thursday or Friday..a quasi-mini-blog some days..
Have a good 2010 Jackie K.
My college friend, Pat Edwards, reunited of course via Facebook, has alerted me to this positive development in Yellow Springs, Ohio, where our dear, long-suffering Antioch College is situated. On the main street in town, knitters (and passersby) are stitching artful patches around "the knitknot tree." It's a trend, apparently. See "Knitters dress up trees for public art." As this blog is Endless Knots and I've been known to knit a thing or two, look for some developments here in West Newton (says she, eying the old maple in the back yard). Reminds me of "the note tree" on our beloved Bear Island in New Hampshire, where children (and their grandparents, principally) write messages on pieces of birch bark and tuck them in a particular tree near the island's famed Sunset Rock. This post is for my truly keen readers (TKR), those who not only read my short story, Endless Knots, but wondered if in fact there was a shred of fact in it. Indeed. When I was 20, I did knit a sweater similar to the one described in the story; its pattern was in McCall's; and I did embroider its cuffs with a pattern generated by an obscure mathematician. Herewith, my proof, including an early draft of the short story. And the original masterpiece, the sweater that is, is available for viewing chez moi. As stated below, the story appears in Global City Review, Fall 2007, Number Eighteen. Order your copy here. My short story, "Endless Knots," for which this blog is named and vice-versa, appears in Global City Review, Fall 2007, Number 18. 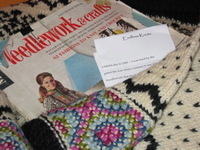 When I saw that the literary review was soliciting pieces for a theme issue called Knit Together, I submitted this story--about a knitter who starts a dot-com. This issue is in memory of Grace Paley, beloved friend, sister, mentor and colleague. An interview with Grace appeared in the Fall 1994 Global City Review. Fine company and a beautiful publication. Thanks to the editors for including my work. Once the scanning is done and cropped, I'll append the story here.